Yes, they are looking very healthy. I’m in the process of hardening off. My least favorite thing to do. Shrinkwrap.. tell us what you do. those are FANTASTIC looking and I grow lots and lots of plants but I don't think I have seen any as nice as those. Usually I start in styrofoam seed starting trays, with a dome, on a heating mat, then remove the dome and the mat when they sprout and put them under lights. This year (thanks to @MuddyBuckets) I used the double solo cup thing, adding used ProMix to the grow plugs that go with the seed starting trays, and with a little hydroponics food in the reservoir once the roots reach the bottom. In a nutshell, I do what Khang Starr tells me to! Last edited by Shrinkrap; 4 Days Ago at 06:28 PM. I was going to finalize bed prep yesterday and plant these peppers out yesterday but rain came in and the prep came to a halt. Several days ago I lightly topped these and will be eager to see the results as I've never done that before. By “lightly top” do you mean pinch out the growing tip? Those look very nice! What kind are they? PJ, yes. I pinched out the growing tip. 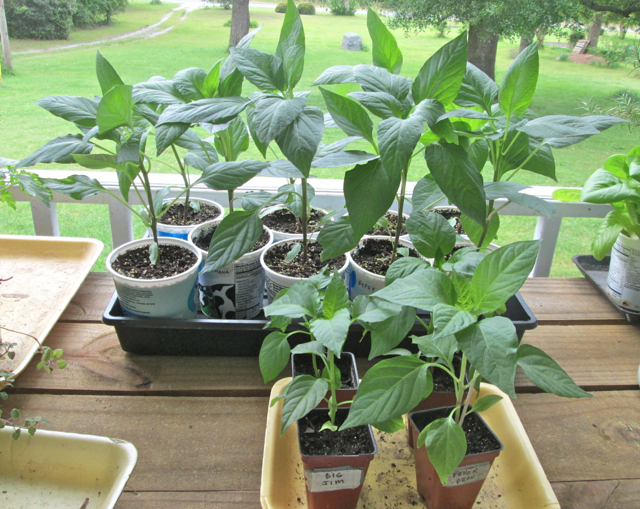 It's an experiment this year after some of last year's peppers, particularly the Jalapeno M, grew rather tall and thin compared to other types. I'm not into real hot peppers, just some milder types for enchiladas, etc and putting up pickled jalapenos. The Jalapeno M was just a trial of an OP but this year I'm back to growing hybrid Mucho Nacho next to it and compare it to a pinched out Jalapeno M. I'm also looking to dry the paprikas for making my own paprika powder to add to the garlic powder and herbs I already dehydrate.